Take the metro to La Muette and walk down the Chaussée de la Muette, it’s a walk along the most splendid bourgeois architecture of the 16th arrondissement. You’ll be greeted by romantic statues on your left hand side, an urban park surrounds you and the fresh air of the nearby Bois de Boulogne might tweak your nose a bit. Walking here, you can’t miss La Fontaine. It appears right in front of you, a huge and heavy guy completely made of bronze, and he’ll make you smile. He wears a wig as people of his kind did in the 17th century, but that’s not the main thing. It’s the two animals at his feet that make the humour of the scene. 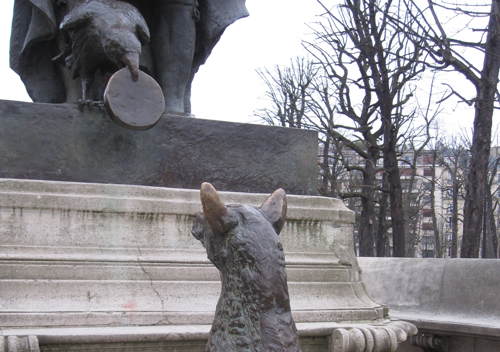 Fortunately, the sculptor added his version of "The Fox and the Crow" to his work. So you can see, at La Fontaine’s feet, the crow with the cheese still in its beak and, in front of the bird, the flattering fox, eager to get it. 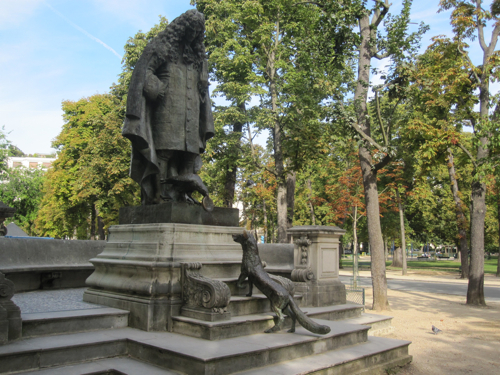 La Fontaine's "The Fox and the Crow"